On behalf of admin of JML Law, A Professional Law Corporation posted in Car Accident on Friday, Feb 02 2018. Los Angeles road construction workers have begun working on the 405 freeway expansion in Orange County as part of the $1.9 billion project. The widening of the freeway, where thousands of car accidents occur every year, is long overdue. The expansion project will include one regular lane in each direction of the 405 freeway from state Route 73 in Costa Mesa and the San Gabriel River Freeway. Also, workers will add a second lane in each direction to reduce traffic and cut down the commute time. However, the latter lanes will be toll lanes, and drivers will be requested to pay for them. The benefits of expanding the 405 freeway cannot be overestimated – reducing the frequency and severity of traffic jams in Los Angeles and cutting down the commute to nearly 30 minutes in the regular lanes (and 15 minutes in the toll lanes) – but road construction itself is going to cause even more car accidents. Any road construction zone in Los Angeles – be it on roadways or highways – increases the risk of car accidents, our Los Angeles car accident attorney at JML Law warns. Undoubtedly, adding new lanes and expanding freeways is a vital step toward making our streets safer for both motorists and pedestrians, but those roads and freeways become extremely dangerous during construction works. 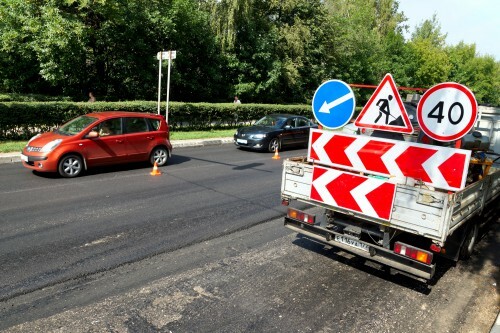 Both motorists and road construction workers face a plethora of dangers and risks at road construction zones, as there can be a lot of negligence and inattentiveness involved at road construction zones. Our best car accident attorneys in Los Angeles warned that if you see cones and construction horses parked along the side of the 405 freeway in the next months, stay on high alert at all times, as road construction zones bring many fatalities and injuries in Los Angeles. Fact: every year, there are over 5,000 road accidents at road construction sites in Los Angeles alone. In these car accidents, nearly 2,000 Los Angeles residents get injured, while deaths range between 25 to 50. Why are there so many car accidents during road construction? Our Los Angeles car accident attorneys at JML Law explain what causes so many car accidents at road construction zones. The most common factors associated with motor vehicle accidents at road construction sites is excess speed and driver inattentiveness. Driving under the influence of alcohol or alcohol. Road construction zones become especially dangerous at night, our car accident attorneys in Los Angeles warn. If you have been injured in a motor vehicle accident at a road construction zone, speak to a Los Angeles car accident lawyer right away. Don’t inform your insurance company about the accident before you establish the full value of your injuries and damages with the help of a skilled attorney at JML Law. Call our Los Angeles offices at 818-610-8800 or send an email to get a free consultation.